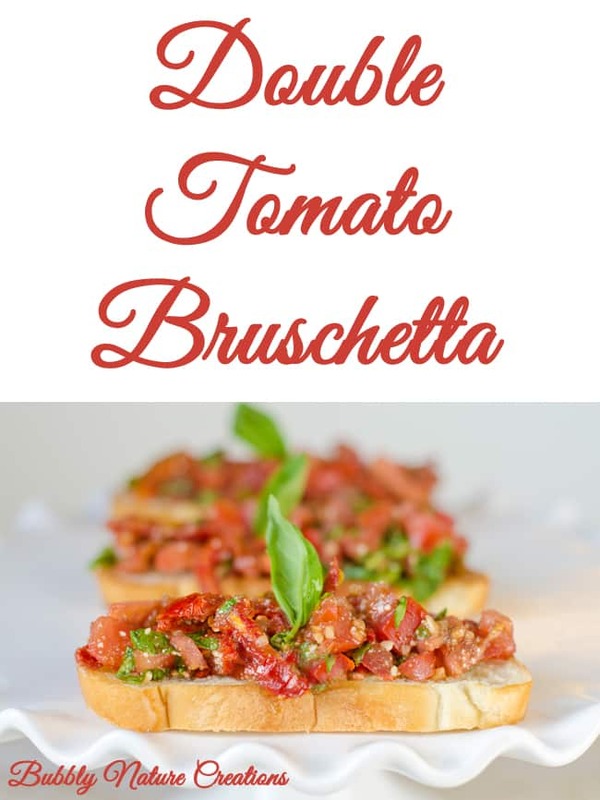 The addition of sun dried tomatoes makes this Double Tomato Bruschetta taste amazing. It’s the perfect appetizer to serve with any Italian themed meal and it’s so easy to make. We love the tangy/sweet and garlicky flavor of this simple fresh appetizer! Beware; this stuff is very addicting! I think I ate my weight in tomatoes the first time I tried this. I have since had a little more restraint while eating the Double Tomato Brushchetta, but its been hard! 😛 No, really it is THAT good. My kids ask for this all the time now and when I make it my hubby licks the bowl. I think the best part is the sundried tomatoes. It makes the whole dish sweet and tangy! It’s the perfect summertime appetizer (or meal if you are like me)! 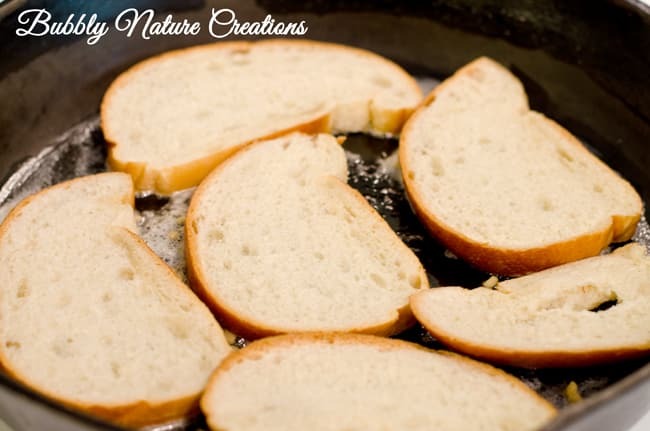 Crisp up some bread in a skillet or griddle with some butter. (You can also just use dry toast to cut back on calories, but I suggest you try at least one buttered one!) It’s so pretty and such a crowd pleaser! I get asked to make this a lot or someone will ask me for the recipe. 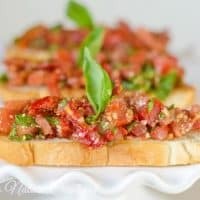 I hope you enjoy Double Tomato Bruschetta as much as we do! 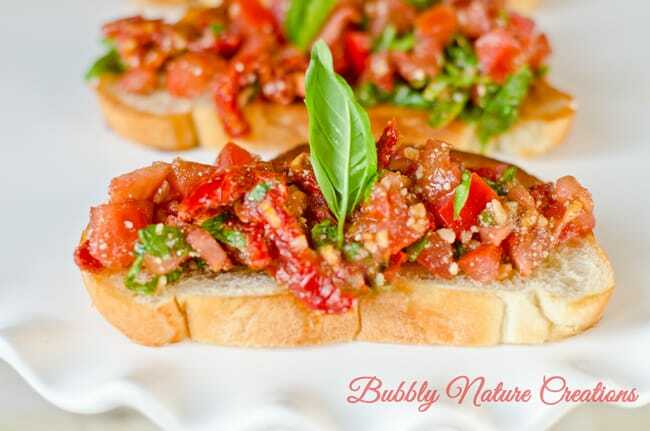 The addition of sun dried tomatoes makes this Double Tomato Bruschetta taste amazing. It's the perfect appetizer to serve with any Italian themed meal and it's so easy to make. Heat enough butter in a skillet or on a griddle just to coat it. Once the butter has melted place slices of french baguette on top and cook each side until golden brown and crispy. Repeat with the rest of the baguette. 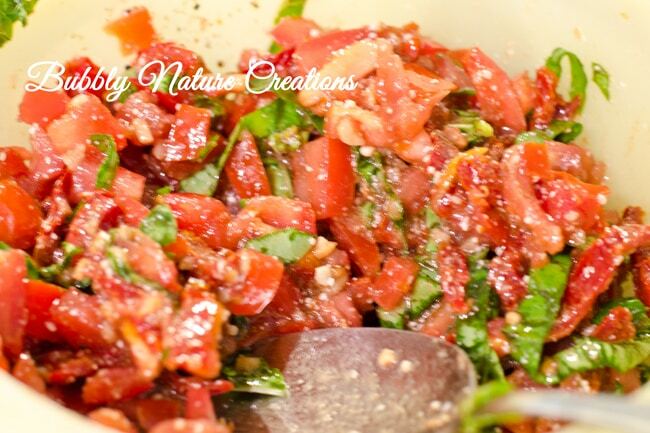 In a large bowl, combine the roma tomatoes, sun-dried tomatoes, garlic, olive oil, Parmesan, vinegar, basil, salt, and pepper. Allow the mixture to sit for 10 minutes. Divide the tomato mixture evenly over the baguette slices. Serve immediately... Enjoy! That looks delicious. Like order out at a fancy restaurant on a date night with your husband kind of delicious. This looks amazing. I love the sundried tomatoes in it! Pinning it and trying it.